(2:17) These are a shadow of the things that were to come; the reality, however, is found in Christ. Just as the basis of religious life must lie in experiencing salvation, so must the content of religious faith consist, not of theories, visions, self-invented disciplines, but of real events and established facts. In no realm is the “shadow” so easily mistaken for the substance as in religion. Paul passes therefore from analyzing a valuable Christian experience to its expression in realistic religious practice. “THE BLESSING OF GRACE.” The Law is but “a shadow”; but in Christ we have the reality, the substance. “The law is only a shadow of the good things that are coming” (Heb. 10:1). 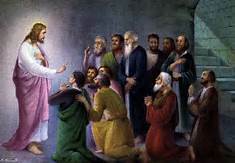 Why go back into shadows when we have the reality in Jesus Christ and He is theirs for the having? This is like trying to hug a shadow when the reality is at hand! Remember―God called, ordained and commissioned Paul a minister to the Gentiles; and the Holy Ghost, speaking through Paul, declared that meat, drink, holy days, new moons and Sabbath days “is a shadow of things to come.” The shadow is the intended likeness of the substance. Almighty God did not fashion Christianity to resemble Judaism but rather fashioned Judaism to resemble Christianity. The reality is not constructed to bear the likeness of the type, but the type is constructed to bear the likeness of the reality. The Mosaic system was a type of Christianity and pointed to the future existence of Christianity. Every sin-offering in the Mosaic economy pointed to the Lamb of God who would be slain “in the fullness of time.” All Israel looked for their deliverer. The Mosaic Law, with its blood offerings, pointed to the day when the divine sacrifice for sins would be offered, and the sacrifice under the Law testified to the death of the One who would come to settle the sin question and purchase redemption. The blood offering under Law not only was a type of the blood to be shed―but it guaranteed that the blood would be shed. no longer engraved on tablets of stone. It is now written indelibly on “the fleshly tables of the heart.” Christ in you is the fulfillment of God’s holy Law in you because Jesus fulfilled every jot and every tittle of that Law (Mat. 5:18). In this way, Christ disarmed the demonic powers and authorities (1:16; 2:10), triumphing over them (2 Cor. 2:14). Every born again believer is now a royal priest (1 Peter 2:9). [1} Gnosticism is the name given to a loosely organized religious and philosophical movement that flourished in the first and second centuries CE. The exact origin(s) of this school of thought cannot be traced, although it is possible to locate influences or sources as far back as the second and first centuries BCE, such as the early treatises of the Corpus Hermeticum, the Jewish Apocalyptic writings, and especially Platonic philosophy and the Hebrew Scriptures themselves. [3} “Having canceled the charge of our legal indebtedness, which stood against us and condemned us; he has taken it away, nailing it to the cross” (Col. 2:14). [4} “Legalism” holds that human beings are essentially bad because they are inherently selfish. No one, unless forced to, willingly sacrifices for another. According to the precepts of Legalism, if it is in one's best interest to kill another person, that person will most probably be killed. In order to prevent such deaths, a ruler had to create a body of laws which would direct people's natural inclination of self-interest toward the good of the state. [5} “But now that you have come to know God, or rather to be known by God, how is it that you turn back again to the weak and worthless elemental things, to which you desire to be enslaved all over again? You observe days and months and seasons and years” (Gal. 4:9-10). [6} In astronomy, the new moon is the first lunar phase, when the Moon and Sun have the same ecliptic longitude At this phase, the lunar disk is not visible to the unaided eye, except when silhouetted during a solar eclipse. Daylight outshines the earthlight that dimly illuminates the dark side of the new Moon. The actual phase is usually a very thin crescent because the Moon rarely passes directly in front of the Sun, except in a solar eclipse.